Full weeks only during Peak Season with a Friday turnover day. Off Season allows for nightly rentals (3 night minimum) with a flexible turnover day when available. Already know where you'd like to stay? Figure Eight Island is truly a unique and special place for a family beach vacation. The island is known for its beautiful sandy white beach, cool blue-green water and casual environment. Vacationers enjoy a variety of activities including beach combing, surfing, jogging, biking, crabbing, tennis, kayaking, and much more. Representing over 80 properties, Figure Eight Realty boasts the most vacation rental properties on this exclusive, privately owned island. Our NC vacation rentals range from luxury oceanfront rentals to more modest waterfront homes, but are all well-equipped with the comforts of home. We offer numerous oceanfront homes, waterfront homes on the sound, interior and salt marsh vacation rental properties for those seeking a tranquil and private getaway. 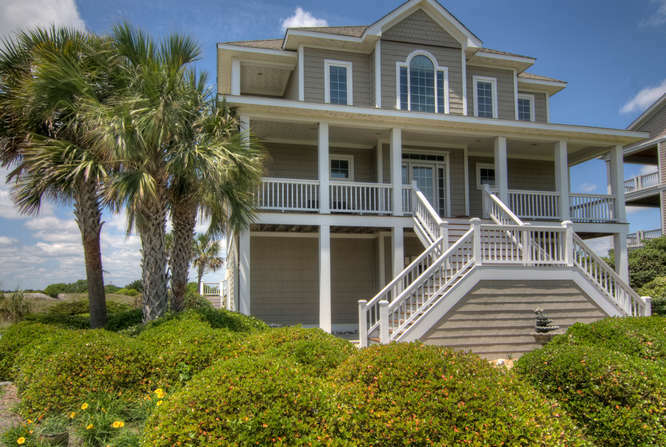 Whether you're interested in a romantic weekend getaway for just the two of you or a tranquil family beach vacation, you won't want to leave Figure Eight Island once you arrive. For more information about our extensive selection of vacation rental properties, contact Figure Eight Realty today!